A small blade does not necessarily require a small handle. The advantage of a shorter blade is the possibility to work in a controlled and very safe way, yet using a lot of force. The proportionally long handle offers a maximum level of control. 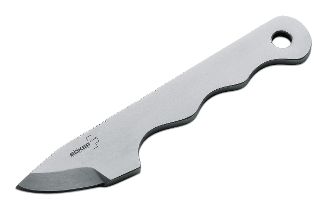 The pronounced finger grooves and the corrugated structure of the blade spine give the knife additional stability. Doug Hartsook created a small but extremely sturdy knife for intricate chores, crafted of high performance 440C stainless steel. Includes a Kydex sheath and ball chain.